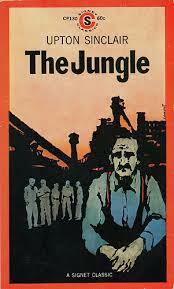 The Jungle by Upton Sinclair is a book that I wish I’d read years ago. The lessons contained within are heartbreaking, unimaginable and essential. The writing was precise, descriptive and affecting. While I didn’t exactly enjoy this incredibly depressing book, it was one of the most powerful books I’ve read. I know that many reviews complain about Sinclair’s Socialist lean, as he does make it very apparent in the last 50 pages that he believes Socialism is the way to avoid the problems depicted in this book, namely the abuse of worker’s by the bosses, poverty in general, the link between poverty and crime and the stigma against immigrants. To me, the protagonist’s progression to Socialism made sense, was certainly backed up and was important to the overall text. I’m not sure how so many people seem to separate it from the text and say things like, “Oh, I loved it…except for that last Socialist bit in the end.” Perhaps they are the same sort of people who ‘love’ The Diary of Anne Frank. You know, except for that whole depressing holocaust part. This entry was posted in book reviews, favorites, fiction and tagged book review, favorites, fiction, sinclair, socialism. Bookmark the permalink.